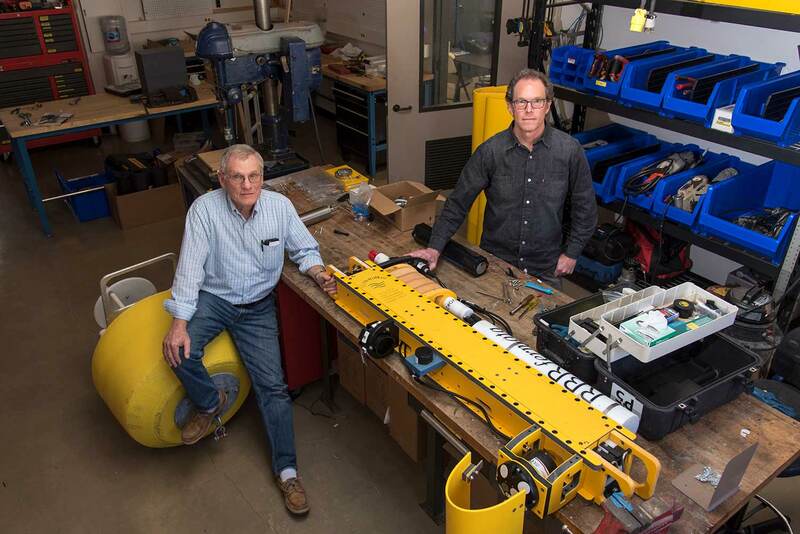 Scripps oceanographer Robert Pinkel (left) and principal design engineer Mike Goldin with ocean-sensing instrumentation. 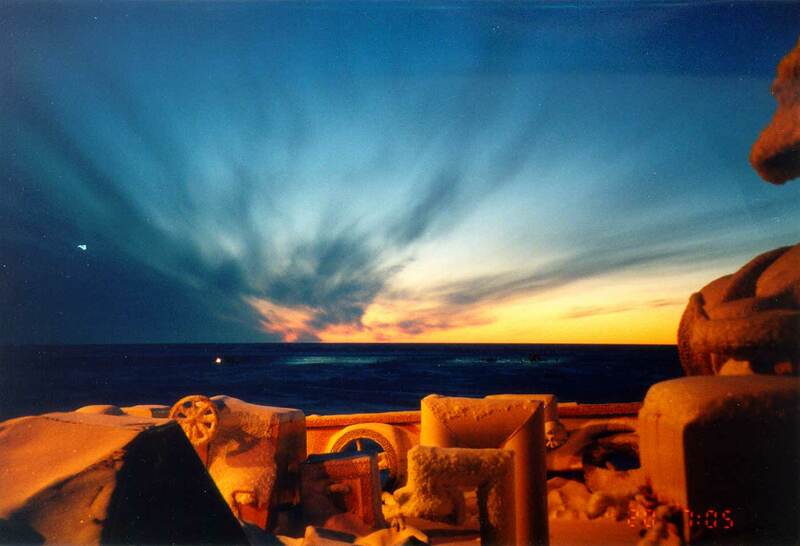 Goldin and Pinkel took part in several research expeditions to the Arctic including the 1998 Surface Heat Budget of the Arctic Ocean (SHEBA) experiment in the Beaufort Sea. On Puerto Rico’s northern coast, oceanfront homes in Barceloneta rest on a narrow coastal plain protected from the onslaught of waves by sand dunes on the beach. Isabel Rivera-Collazo has been traveling to this location to perform research for nearly 25 years, since her days as a college student. An environmental archaeologist at UC San Diego, she has pursued her research operating under the maxim that archaeology doesn’t move. Now, recent events have caused her to abandon that notion. Along this coast, people migrating from modern-day Venezuela or Colombia once settled 2,200 years ago. They performed rituals and other activities in large arenas, the outlines of which are still distinguishable from the natural landscape when viewed from sufficient altitude. Rivera-Collazo can trace the evolution of the settlement near the mouth of the Rio Grande de Manatí from the time of even earlier peoples nearly 5,000 years ago, through the first interactions of indigenous peoples with Spanish explorer Ponce de León to present-day housing tracts. Rivera-Collazo means to complete the picture of morphing civilization on the island where she grew up but is limited by a change in her circumstances. Her research specialty is understanding how humans have adapted to climate throughout history, but rising seas are washing away her research sites faster than she can make the arrangements to begin fieldwork. She shows photos taken this summer of buried pottery shards that had been undisturbed for hundreds of years. In the pictures, they are washing out to sea in small dislodged bits after storm surges attacked the sand dunes and small bluffs behind the beach. She can point to evidence that once, hundreds of years ago, it was possible for people to build their homes on what is now the ocean-facing side of the protective dunes because back then the land would have extended several dozen meters farther out to sea. If one excavates the dunes themselves, they find buried in the sand the remnants of houses from 600 years ago and before. The berms retreated slowly at first but much more rapidly in the past decade, hastened in one burst by the catastrophic Hurricane Maria but mostly by steady relentless waves. From February to June of this year, the oceans ate away another six feet of dune. Since the 2018 storm season began in July, even more has been taken, Rivera-Collazo said. 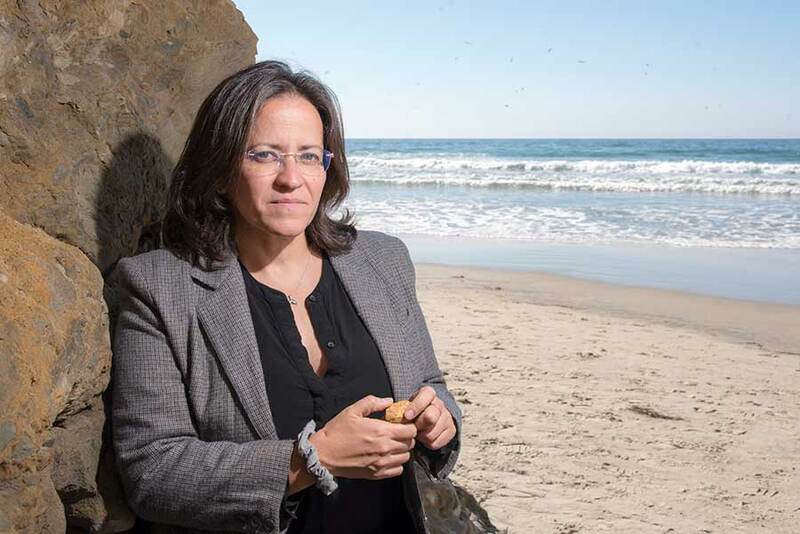 Like several scientists at Scripps Oceanography, Rivera-Collazo is telling a narrative about climate change through her research. Now, she herself is a character in that story. For decades, scientists have presented abrupt climate change as something that has happened in the far distant past or in models of future scenarios that play out only on computer screens. Now that future is here and a growing number of scientists are returning from the field with their own anecdotes about changes they never expected to see, researchers say they need to build the effects of rapidly skewed conditions into the way they conduct their work. By now, the evidence for the most comprehensive change in nature in all human history is well established. The story was reiterated in last week’s report from the Intergovernmental Panel on Climate Change, which estimates that humanity has little more than a decade to stanch its use of fossil fuels if it wants to avoid catastrophe. Levels of the heat-trapping gas carbon dioxide have risen dramatically since the beginning of the Industrial Revolution. They surpassed 400 parts per million (ppm) of air in the atmosphere five years ago after at least 800,000 years having never exceeded a concentration of 300 ppm. The increase in CO2 and other pollutants that contribute to the greenhouse effect has set in motion a range of consequences. Extreme heat waves have become more frequent causing an upsurge in heat-related deaths and illnesses. Sea levels have risen to the extent that relocations of coastal habitations are under way in several locations around the world. Extreme droughts have become more common as have deadly floods. The pH of seawater is estimated to have decreased in the past 200 years from 8.2 to 8.1, a 30-percent drop, as the oceans take up a portion of the CO2 that society emits. The years 2014-2017 are the hottest in recorded history with 2018 expected to crack the top five. Temperature records have been set in nearly every continent this year – from the highest verified overnight low temperature of all time set in Oman 42.6℃ (108.7℉) to the highest temperature ever recorded in Japan (41.1℃ or 106℉) and the highest ever recorded in the village of Kvikkjokk, Sweden, 32.5℃ (90.5℉) in July. Kvikkjokk is located within the Arctic Circle. Forecasts made in the 1990s about various climate change-induced phenomena – from hurricanes so strong they need new categories to year-round wildfire seasons to once-in-a-century floods happening multiple times in a decade – have largely been borne out. Oftentimes, predictions have been exposed in hindsight as having been too conservative. Even the shocking IPCC report understates the world’s predicament, according to researchers at Scripps and elsewhere. 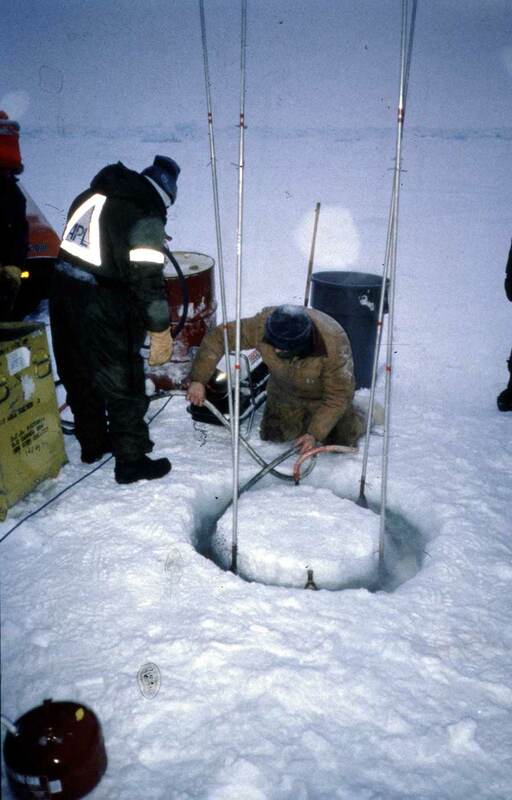 Researchers bore a hole in sea ice to access the ocean beneath during the 1998 Surface Heat Budget of the Arctic Ocean (SHEBA) experiment. Severinghaus has studied paleoclimate at Scripps since 1994. 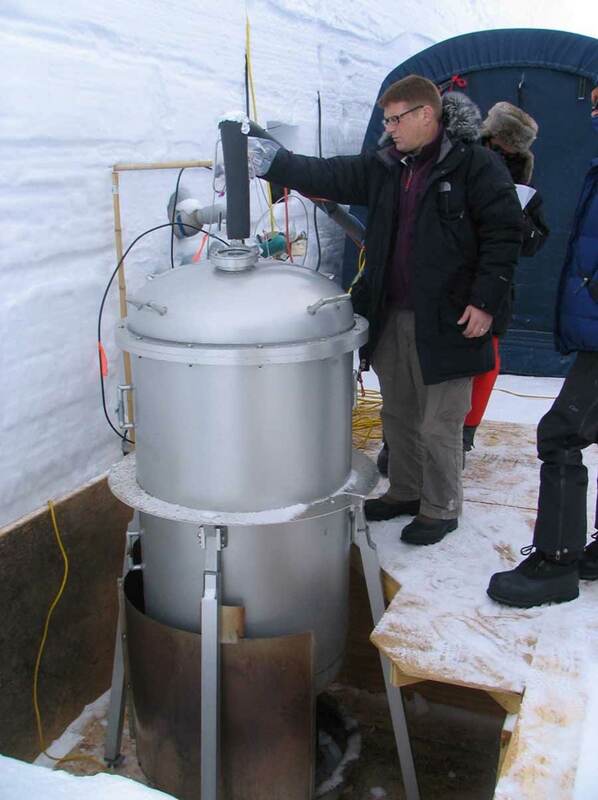 A frequent visitor to glacial field sites in Greenland and Antarctica, he is one of the scientists who makes precise measurements of various gases to investigate the frozen reaches known as the cryosphere. Those gases provide a Rosetta Stone guide to climate conditions in the past and put present-day changes in historical context. Recent climate can be captured in gases trapped in firn, slightly compressed snow beneath the surface of Greenland’s glaciers. There used to be a standard way to measure the thickness of the firn layer by measuring the amount of a nitrogen isotope in air samples. However, in the past 30 years there has been nearly 2℃ (3℉) of snow surface warming in Greenland. This has skewed raw data about the mix of gases in the firn. It has misled some research teams to overestimate the thickness of the firn, Severinghaus said. As a result, it has caused inaccurate estimates of the timing between rises in temperature and levels of the carbon dioxide during ancient warming events. In his lab, Severinghaus and colleagues have worked out a new method that filters out the warming effects to give truer results, and a paper on that is nearing publication. “There is absolutely no doubt” that the majority of the warming is due to human-caused climate change, Severinghaus said. Oceanographer Rob Pinkel got his Ph.D. at Scripps 1974 and has been affiliated with the institution ever since. Pinkel made his first trip to the Arctic in 1986, when it used to be standard practice for scientists to make camp on thick slabs of sea ice, then cut holes to access the ocean below. At that time, sea ice floes were thick enough to support improvised runways where small research camps could be supported by aircraft. The camps would start with an initial crew delivered by airplane to a site of scientific interest that also had a stretch of smooth flat ice. This pioneering team would set up a tent, improve the runway, and gain a foothold. A small research community would then grow one flight at a time, and the ocean below could be explored. Camps were often maintained for several months, with intermittent supply flights supporting the research effort. Now, it’s too dangerous to do that. At all but the northernmost latitudes the ice is too thin. 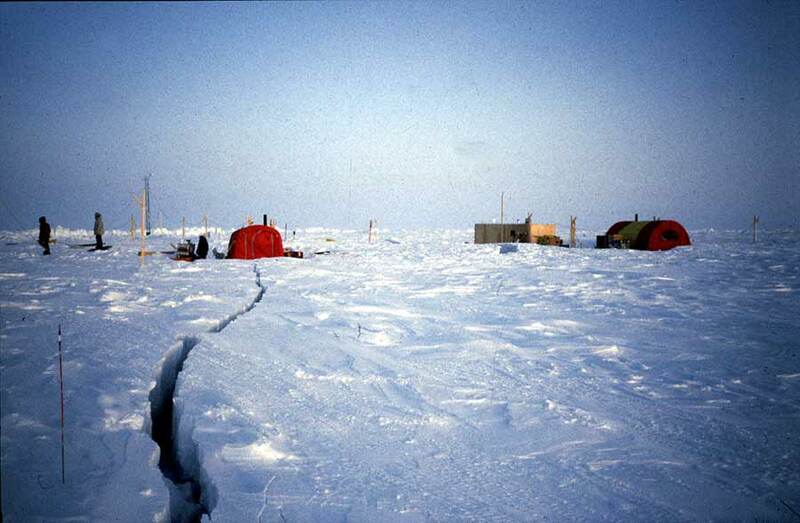 To reach viable campsites would require aircraft to fly close to the North Pole and to the limits of their fuel tanks. Now, most Arctic Ocean research is carried out from ships in late summer and early fall, months when vessels can traverse the ocean with minimal risk of damage by the ice. Research protocols now dictate that camp-based fieldwork is only to be done as a supplement to ship-based work. Pinkel recollects getting his first experience of changes at the poles 20 years ago. In the Beaufort Sea north of Alaska for the year-long Surface Heat Budget of the Arctic Ocean (SHEBA) experiment, his crew set up its science gear near a Canadian Coast Guard cutter. It was fortuitous that the ship was there because the surrounding science camp broke up multiple times in the course of the year. 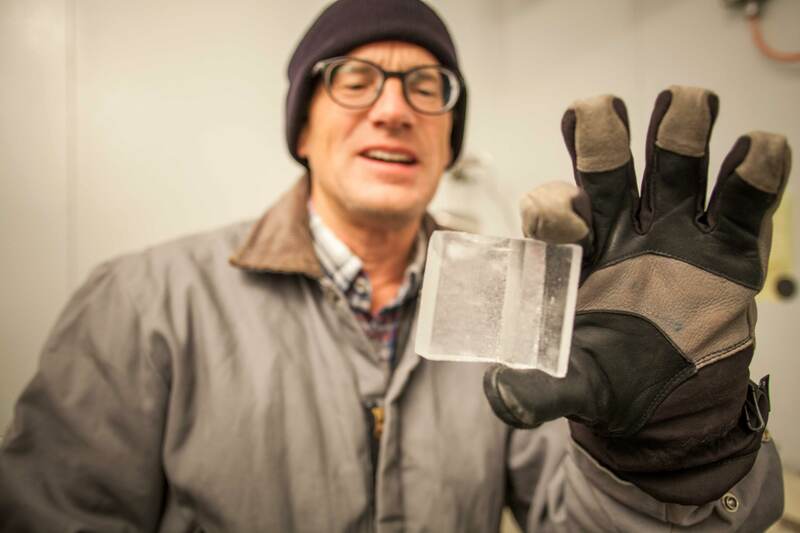 In one case, the Scripps team rescued its research gear just as a crack in the ice silently opened beneath it. Some $250,000 in research equipment was hauled onto stable ice at the last minute. Several times during the year, the camp's runway broke up. The experiment was cut off from shoreside support until the ice refroze and could be leveled sufficiently to land planes. Pinkel’s experience demonstrates that dealing with the unexpected is obviously not brand new to scientists in 2018. But in a break from the past, there is now a greater willingness among scientists to call climate change by its name when they see it. Traditionally they have characterized human-caused global warming in terms of probabilities: In the way a set of loaded dice might increase the chance of a certain number being rolled, society’s alteration of the planet’s physics and chemistry are increasing the likelihood of extreme weather. Now that some events are so obviously influenced by human-caused global warming, there is no risk to scientists’ credibility for saying so, said Severinghaus. Last year’s Hurricane Harvey was the biggest rainfall event in U.S. history. Two Houston suburbs recorded more than 60 inches of rain during the storm, which left 106 people dead and cost an estimated $125 billion. The human fingerprint behind abnormally warm sea-surface temperatures in the adjacent Gulf of Mexico was already established so it came as no surprise that the hurricane would take added moisture to wherever it made landfall. In the end, scientists estimated that half the flooding Houston received was a direct result of that human-caused warming. Scientists believe the same is true of Hurricane Michael, which strengthened in a shockingly short amount of time to a category 4 hurricane early last week before leveling parts of the Florida Panhandle. In Rivera-Collazo’s case, the probability of the unprecedented guides fieldwork protocols. There is abundant new evidence that the oceans are taking up more heat than ever before and the accelerated pace of sea-level rise has been well-documented. There is thus every reason for her to expect that the ocean will encroach on her dig sites on a regular basis. Her team is expanding its skill set in underwater archaeology in preparation, she said. Researchers had to rescue a $250,000 sonar from the science tent in red during the 1998 Surface Heat Budget of the Arctic Ocean (SHEBA) experiment in the Beaufort Sea. The experiment was fraught with various difficulties related to the ice breaking up unexpectedly. Pinkel and Severinghaus’ experiences correspond to several lines of evidence that show a major decrease in Arctic sea ice, upwellings of increasingly warm water from lower latitudes, and an increase in Arctic surface temperatures nearly twice that experienced by the rest of the planet. Polar scientists especially have to take rapid climate change into account to keep science parties safe or just to account for nuisances, said Severinghaus. In 2012, he had to alter his own plans to survey ice when a flood caused by surprise glacial melt swelled a river and destroyed the bridge that leads to Greenland’s largest airport. Young researchers see ever-shifting baselines as a given as they embark on their careers. This summer, Scripps graduate student Kaitlyn Lowder needed a supply of seawater from Scripps Pier for an experiment to observe the stress response of larval lobsters exposed to a range of ocean temperatures. She selected a water temperature of 22℃ (71.6℉) as the high in her experiment, a temperature at which one might expect the crustaceans to alter basic life functions such as growth, shell formation and so on. Lowder draws seawater for her experiments from a supply pumped in from the ocean via Scripps Pier. The pipes on the pier also send seawater to the tanks at Birch Aquarium, numerous labs, and those owned by saltwater aquarium owners around San Diego who fill up at a public spigot on campus. The problem was that before Lowder could supply this warm water, she had to cool it first. The average sea surface temperature at Scripps Pier in the month of August is 21℃ (69.8℉). That’s an average based on 102 years of recordkeeping at the pier. On Aug. 1, 2018, it reached 25.9℃ (78.6℉). One could argue that the warm water off San Diego is simply a natural anomaly. During the freakishly warm July 2018, an unusual warm pool of water formed off the California coast stretching from Baja California to Point Conception. Such occurrences come and go. Elsewhere on the West Coast, seawater temperatures hewed to historic norms for the most part. On the other hand, virtually every water temperature record off the San Diego coast has been set in the last three years. Buoys in the Coastal Data Information Program have been taking ocean temperatures since 1975. The top 30 daily readings since then have all occurred between 2015 and 2018. The record high at the pier set on Aug. 1 was rebroken three more times before Aug. 10. The managers of the Shore Stations program that has logged pier temperatures since 1916 weren’t very surprised because ocean temperatures have been rising over decades. The trend gives any new warm spurt a pedestal on which to reach record-breaking heights more easily. Lowder sees young marine scientists like her having to make career decisions their predecessors could afford to be less concerned with. Up-and-coming researchers have to decide which ocean phenomena are significant enough to devote years of research to and which will be too ephemeral to spend time on in a time of rapid change. One that is of interest to her is ocean acidification. She must decide to mimic future pH conditions in the lab based on peer-reviewed predictions that may already be out-of-date or skip ahead and assume the pH will drop even further. Scientists are only now observing that the acidity of the ocean is wildly variable even within a day along the California coast. Defining an initial set of conditions requires an increasing flexibility on the part of experimentalists. Pinkel and Rivera-Collazo think of the lived experience of generations past and present when contemplating their own research experiences. For the entire history of polar exploration, the ice-covered Arctic Ocean has been a unique laboratory. Unlike all other oceans, the ice there shields the ocean interior from the stormy atmosphere. Beneath is a body of water as still as an aquarium relative to other oceans. Scientists favor it as a place to study many important but subtle mechanisms that are hard to observe in other more energetic oceans to the south. As the ice cover recedes, the role of the Arctic in the overall climate system will change significantly. Pinkel doesn’t get hung up assigning blame for the current situation but knows it is most certainly a reality that must be addressed. Likewise, Rivera-Collazo says society must rethink how it plans for future weather events. It is vital, she said, to look to history for clues on what to expect, but making assumptions based on very recent past experience can only be flawed. Climate for those who live through it is simply the average experience of weather within generational memory. Now that there are no more guardrails for researchers and non-researchers alike, a certain kind of open-mindedness will be a necessity.